The good news is that B2B Marketing innovation is alive and well and can be found in many places. One place I like to look is case studies and awards for successful B2B marketing work. A few weeks ago I presented at DemandGen Report’s B2B Content2Conversion conference along with tier one B2B marketers like Michael Brenner from SAP, Jill Rowley from Oracle / Eloqua, Ann Handley of MarketingProfs, Joe Pulizzi from Content Marketing Institute and many others. On top of hearing strategy and practical tactics from speakers, there was a Killer Content Marketing Awards presentation that highlighted some incredible creative, execution and most of all, performance of B2B content marketing programs. Logicalis – Using content assets such as emails, microsite and ebook, Logicalis developed a thought leadership effort that supported sales teams by enabling custom messaging based on the prospects interaction with the campaign. With a target audience of about 2,000, nearly $8 million in new pipeline business was closed. Sales Benchmark Index – Targeting prospects that were newly hired VPs of Sales, this campaign focused on providing corporate pains with VPs of Sales fail as well as case studies of successes. The promoted ebook was downloaded by target VPs 5,781 times. Here’s the full deck for details on each Killer Content Marketing campaign plus performance data. Enjoy! 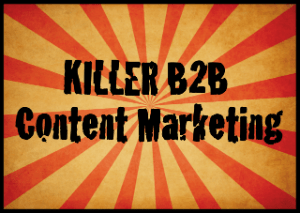 What are some of your favorite killer B2B content marketing campaigns? Which B2B brands are doing it right?